Smith College yearbook photos (1897) of Lola Maverick Lloyd and Elizabeth Redfern. Charlotte Dennett and Robin Lloyd holding their grandmothers photos. Hungarian 'militant feminist' Rosika Schwimmer. Logo created for the 100th anniversary of WILPF. Robin 'talking' with the bust of her grandmother. Sculpture created by Charles Haag. 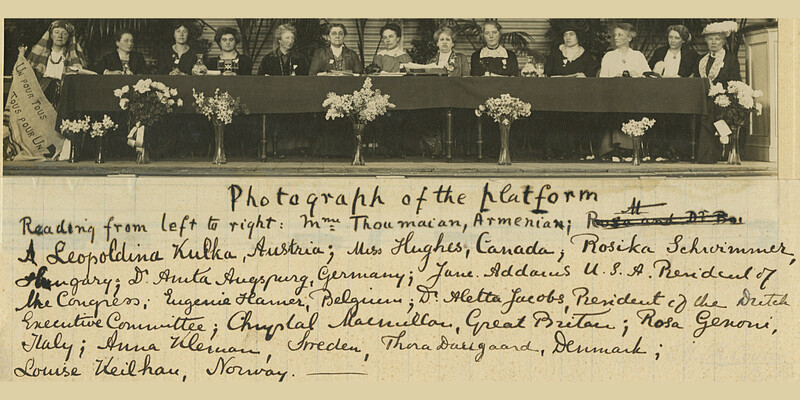 Women at the dais at the women's peace conference at the Hague, 1915. Talking with our Grandmothers is a performance piece that uses dialogue, images and letters from 100 years ago to commemorate World War 1 and investigate its impact on the lives of our grandmothers – and thus on ourselves – of this cataclysmic event in world history whose effects are still being felt today. Long time friends and members of the Burlington branch of the Women’s International League for Peace and Freedom (WILPF) Robin Lloyd and Charlotte Dennett created their performance piece to celebrate WILPF’s 100th anniversary. WILPF is the longest lasting international women’s peace organization, and was founded in April 1915 when some 1200 women from neutral and belligerent countries braved closed borders, submarines and bombs to meet in the Hague in an effort to bring an end to World War I. The two Vermont friends only recently discovered that their grandmothers graduated from Smith College the same year --class of 1897. Though their grandmothers took completely different paths after graduation – Lola Maverick to become a peace activist and one of many founders of WILPF, Elisabeth Redfern to become a missionary educator in Turkey – both women were deeply affected by World War I.
Robin and Charlotte engage in dialogue with each other and their grandmothers about their grandmothers’ struggles to make a difference in the world at a time when Victorian mores prevailed. Both grandmothers were suffragists and feminists, but their similarities ended there. Lola Maverick Lloyd actively opposed World War I, traveled to the Hague, and became a lifelong peace activist right up until her death (in part from depression over World War II) in 1944; Elisabeth Redfern Dennett became a strong supporter of the American College for Girls in Turkey, where she taught Middle Eastern women to become nurses, but remained silent when the Turks joined Germany in World War I and was heartbroken when Germans later killed her step-son, an officer trained in gas warfare. Lola, as a WILPF activist, advocated for disarmament, mediation, an international court of justice, and became an early promoter of world government; Elisabeth supported her only remaining son (Dennett’s father) as a top intelligence officer in World War II, only to see him die mysteriously following a top secret mission to Saudi Arabia. As their granddaughters try to come to grips with the horrors and underlying causes of a century of wars, they find inspiration in the determination of women around the world to find new approaches to conflict-solving, seeking power in numbers and insisting, as never before, that women have a say in matters of war and peace. After the performance, audience members are encouraged to share their reflections, through anecdotes from their own grandparents and great grandparents, about World War I and the wars that followed, and what can be done to resolve conflicts without resorting to arms. The event comes to an end with the presenters encouraging women to join them at the Hague, Holland for a week of celebration, networking and strategizing (April 22-29) under the banner, “Women’s Power to Stop War.” (For more information go to www.womenstopwar.org). If you would like to bring a performance of Talking with our Grandmothers to your community, please call Robin at 802-355-3256 or email staff@greenvalleymedia.org. This performance piece is sometimes a solo show, Talking with my Grandmother, featuring Robin Lloyd and her grandmother Lola Maverick Lloyd.